Danny Mason is a defensive lineman currently playing for the Ottawa REDBLACKS. Signed as a free agent on Oct. 8, 2017. 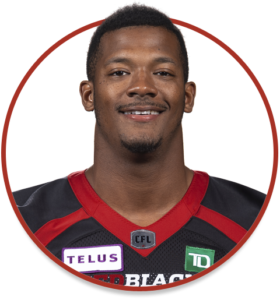 (Calgary) He made his CFL debut in Game 17 against Edmonton and recorded two defensive tackles and one QB pressure. Mason made his professional debut in 2014 with the Indoor Football League’s Texas Revolution and later joined the Colorado Ice. On Jan. 1, 2015, he signed a futures contract with the National Football League’s Denver Broncos. He spent part of the 2015 season on the Chicago Bears’ practice roster and was on the injured-reserve list in 2016 before rejoining the Broncos in 2017 and attending Denver’s training camp. Mason played 40 games as a linebacker over four seasons (2009-12) at Texas A&M-Commerce. He recorded 280 total tackles for the Lions including 115 – 41 solo and 74 assisted – during his senior season. Mason also accumulated 24.5 tackles for loss, six sacks, two forced fumbles, three interceptions including one pick-six and 14 pass breakups. After his senior season, Mason was named the Lone Star Conference’s linebacker of the year and first-team all-conference. Mason played football and basketball at Shawnee High School in Louisville, Ky.